Presented at the National Scholarly Communications Forum, Canberra, 7 September 2015. About 10 days ago I was part of what the Australian described as a ‘frenzy of hyperbole, hysteria and straightforward misinformation’ as Twitter responded to Border Force’s plans to patrol the streets of Melbourne in a crackdown on visa fraud. Like many others I responded to the announcement with anger, sadness, and disbelief. Was this what we had become? But the agency’s actions also generated well-deserved ridicule as the hashtag #borderfarce quickly gained ground. Some months ago, in the wake of ‘Operation Sovereign Borders’, I created a Twitter bot and web app that generate random operation names. Their professed aim is to ‘protect Australia from meaning’. So of course, Operation Random Words quickly leapt into the fray in support of Border Force. More pointedly, I shared a slide from my recent keynote at the international digital humanities conference where I drew a connection between the Immigration Department’s use of the term ‘illegal maritime arrivals’ and the category of ‘prohibited immigrants’ employed under the White Australia Policy. Then and now. It’s probably worth pointing out that this was easy because I’d posted the full text on my talk online within a hour of delivering it in July. Of course I wasn’t the only one pointing out historical connections. 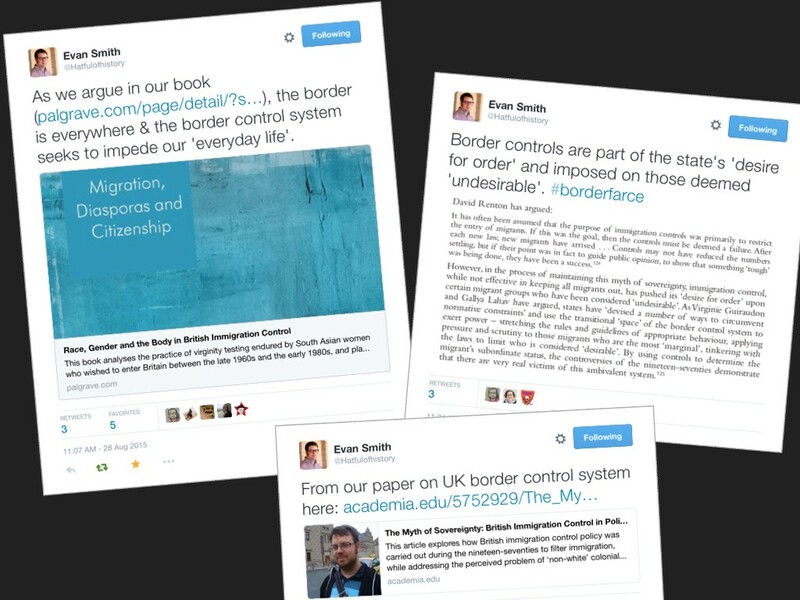 Evan Smith, from Flinders University, issued a steady stream of tweets that linked to literature on immigration and the control of borders. Kate Bagnall, a historian of Chinese Australia, noted further parallels with the actions of Customs officers enforcing the White Australia Policy. I shared Kate’s article about one legitimate resident’s arrest by Customs officers suspicious that he seemed a little too Chinese. For those venturing onto the streets of Melbourne, I helpfully offered a source of suitable identity papers – linking to a test interface Kate and I are building to help navigate through many thousands of documents relating to the White Australia Policy that we’ve harvested from the National Archives of Australia’s online database. Ok, so none of these activities had any significant impact on the unfolding of events – although one of Evan’s tweets did make it into a summary of the social media frenzy published by the Sydney Morning Herald. The historical and political dimensions of the debacle were clearly laid out by Mark Finnane in an article for The Conversation a few days later. But the sense of immediacy was compelling. Something was happening, and we were part of it. The digital tools at our disposal give us the opportunity to mobilise scholarly research and resources and make them available within existing social spaces, in the context of daily events. Communication can come in the form of rapid, pointed, small-scale, ephemeral interventions. Just the day before Border Farce I realised that an article had been published in Australian Historical Studies that makes heavy use of an online tool I created. 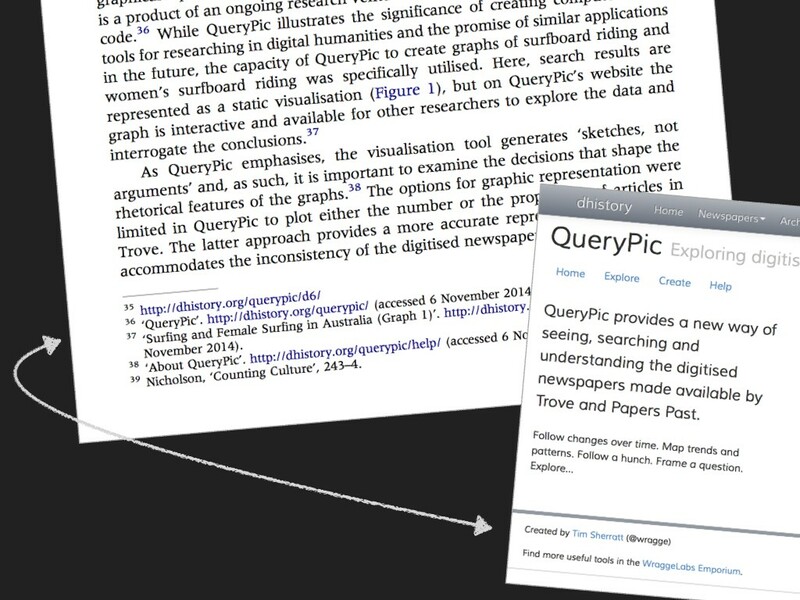 QueryPic visualises search queries within the massive collections of digitised newspapers available through Trove and Papers Past. It’s simple, but surprisingly useful. I created the first version of QueryPic in 2011 and it’s been through several incarnations since. It’s been developed without any sort of institutional support or funding. I built it because I was interested in exploring and encouraging new ways of working with large digitised collections – and I thought others might find it useful. QueryPic has been cited in other publications, but I was still pretty excited to see it pop up in Australian Historical Studies. What was disappointing, however, was that while all manner of other scholarly works were fully cited, QueryPic was without an author. I don’t know if this was a matter of style or merely an oversight, but it does reflect the way that many digital projects are treated. Anyone who’s created a complex historical database, or designed a tool for historical analysis, knows that there are many judgements to be made, models to be constructed, concepts to be defined and tested. And yet this work is often thought to support, rather than constitute, research. My own research practice is framed around building. By creating tools, resources, interfaces, visualisations, artworks and games, I pursue questions about our relationship with the past. As in any research, I’m frequently surprised by the results. I do this in public because communication and use are central to my practice, even though it doesn’t necessarily result in conventional research outputs. Work done by historians using digital methodologies or media for research, pedagogy, or communication should be evaluated for hiring, promotion, and tenure on its scholarly merit and the contribution that work makes to the discipline through research, teaching, or service. I suppose it should be obvious, but recognition and reward are still often linked to specific forms of scholarly production. Why shouldn’t the design, management and completion of a large complex digital project be seen as the equivalent of a book? As the guidelines note, use of digital technologies can challenge the nature of what we do. It’s not just a matter of fiddling with the boundaries, but also reconsidering the shape and structure of academic disciplines and the values that maintain them. The digital humanities community has strong links with the Open Access and Open Source software movements, demonstrated through its commitment to sharing. From code to courses, publications to project management, follow a bunch of digital humanists on Twitter and you’ll see a constant exchange of ideas and resources. It’s a commitment to openness, but it’s also an expression of scholarly solidarity and commitment. It’s something that guides my own engagement with the academic community and beyond. Just this week I shared some code and data relating to publicly available ASIO files held by the National Archives of Australia. I’ve harvested the metadata of nearly 12,000 files and downloaded almost 300,000 page images. 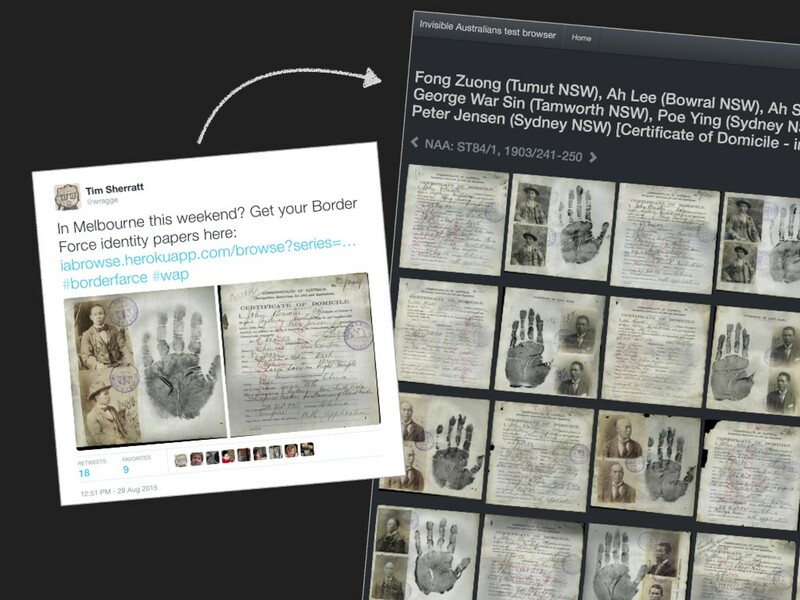 BorderFarce highlighted historical connections across immigration surveillance and control, and I’m keen to see what structures and patterns emerge from large-scale analysis of both the ASIO and White Australia files. But why keep it all to myself? The metadata is all available from my GitHub site and if you have 70gb free I can share the images as well. I’d like to try and build an informal research network, not just mine the data for publications. My bio used to say that I was a ‘digital historian’. I’ve changed that recently to just ‘historian and hacker’ because it’s the approach rather than any specific technology that’s most important to me. The hacker ethos is collaborative, critical and constructive. It’s about diving in and trying to make things better. I want to develop a framework that supports other hackers – to help them build careers, pursue their ideas, manage their risks, and be recognised as scholars. Those of us privileged to have some measure of security and recognition should help create safe spaces for experimentation in content, methodology and disciplinary formation. As the AHA guidelines note, it’s a shared responsibility – one that is expressed through many routine acts of review, assessment, or advice. I want a scholarly practice that has room for the angry and the weird alongside the rigorous and detached. That sees in digital technologies not just the chance to crunch huge quantities of data, but the opportunity to tinker with our preconceptions, to be playful and political, to explore emotions as well as evidence, to create bots as well as books. It might only seem like a tweet, a zip file or a blog post, but in a world that offers us #borderfarce, each small intervention carries with it an opportunity to pursue scholarly practice beyond traditional boundaries, and create something different. I think that’s an opportunity we should nurture. Previous Post Coming soon — our first LOD-Book! “I want a scholarly practice that has room for the angry and the weird alongside the rigorous and detached” http://t.co/oRCad5J4XH Me too.